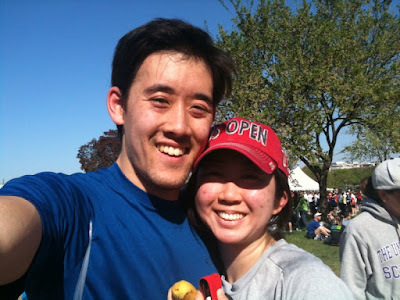 Sunday was the annual Cherry Blossom 10-mile run. I tried to run this last year but had to bow out because of a lower-back injury (the worst pain I've ever experienced in my life). This year, with no complications, Chris and I stepped onto the race course and finished strong ... er, at least he did. I could tell I was slowing Chris down so I waved him ahead at about mile 5. He sped away and left me to confront the next five miles all alone. The challenges included: almost stepping on a dead squirrel flattened into a pancake; annoying cheerleaders who insisted on yelling the remaining mileage ("Just 4 more miles guys!" to which I wanted to shout, "SHUT YOUR TRAP!!!" >:oI); slight runner's dia**hea at mile 9 (shameful but true! ); and a desperate uphill climb to the finish line! After finishing the race, I walked in a daze toward the muffins and bananas only to hear, "Jeannie!" behind me. I whipped around and there was Christopher, resplendent in a sky blue exercise shirt and shorts, sweaty but triumphant. His grin was worth a million bucks! good job, jeannie!!! and chris...how impressive! in the interest of accuracy, jeannie insisted that i move on because i was annoying her. i thought i would be loyal and stick to her side, but she didn't need it i guess. She probably just needed to pull her red cap down, crank up her music and spin those little legs. go jeannie! also, it wasn't exactly easy for me. look at how much i aged from the before pic to the after pic. what? runner's diarrhea? you for real got? i didn't need to know that because now i'm going to worry about this. my dad and i are doing a half marathon june 6. 13.1 baby! :) miss you dear friend. I am not sure that I really had the real thing ... I think mostly I hadn't "read a magazine" the day before. I kept trying to but I couldn't for whatever reason (nerves?). 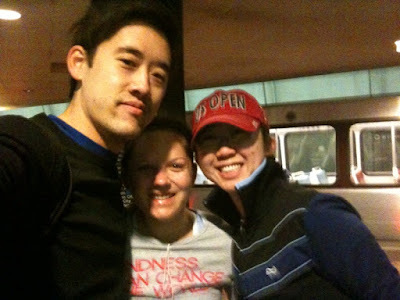 HJ, a half marathon in June!? WOW! That's going to be incredible. Just make sure to "read a magazine" the day before and you will be fine. This is probably TMI for some of you readers out there. Apologies. One thing you have to know about Koreans is that they are very open about their bathroom business. I'll try and be more sensitive to this in the future! i had to blog on fb just to use this HT u speak of. yessssss! go poopy pants!